Living… in New York City, always on the hunt for her next drink. 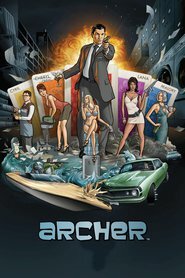 Only then can she get back to her office at ISIS (International Secret Intelligence Service), where she dispenses verbal jabs to her employees, constantly emasculates her son, ISIS secret agent Sterling Archer, evades taxes, and manipulates ISIS’s resources as a means to to pursue her own selfish interests. Profession… CEO of ISIS. Her managerial style involves few carrots but many sticks. She is a classic armchair general, but once upon a time she was an accomplished field agent. In addition to being highly skilled in both firefights and hand-to-hand combat, Malory is quadrilingual and skilled in the art of seduction. Interests… money, attractive men, drinking, drinking more, drinking even more than that. Relationship Status… recently married, although Malory’s extensive romantic history merits discussion. Her list of lovers includes the great jazz drummer Buddy Rich and KGB head Nikolai Jakov, with whom she had a 40-year affair. She does not know who fathered Sterling. While CEO of ISIS she dated Burt Reynolds, to the chagrin of Sterling, for whom Reynolds is his hero. Most recently Malory married Ron Cadillac, owner of a thriving Cadillac dealership in the tri-state area. Challenge… running ISIS, which is undoubtedly the least competent espionage operation in the world. If Malory was an incredible manager, it would still be hard to run ISIS well with her selfish and reckless staff, but Malory is not a gifted boss. She’s constantly drunk, prone to hurling hurtful remarks at her employees, and cares only about her own personal gain. Personality… sarcastic, narcissistic, and vain. Malory will go to great lengths to further her own interests. She ignores petty things like “morality” that would stop her from getting whatever she wants. She is self-righteous and utterly unapologetic, while simultaneously managing to be the most homophobic, racist, and elitist member of the staff. Her competitive fire once helped to make her a great field agent, but now it makes her an uncompromising grudge-holder. She’s also a talented manipulator, and is particularly good at bending her son, Sterling Archer, to her will. Malory Archer's popularity ranking on CharacTour is #1721 out of 5,000+ characters. See our top-ranked characters and read their profiles.